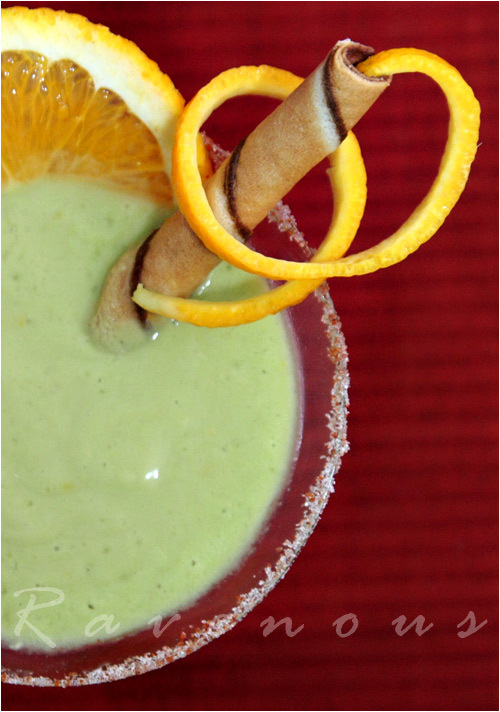 Avocado Orange Licuados and Cookbook Giveaway! Licuados or batidos are refreshing Latin style smoothies similar to the Vietnamese sinh to. They tend to be on the lighter side due to the use of milk and less sweet with the use agave syrup or sugar rather then condensed milk. Apparently these licuados are ubiquitous in Mexico and often found at street corners. 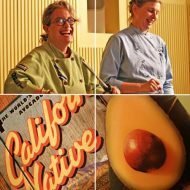 At a recent cooking demonstrating by Mary Sue Milliken and Susan Feninger, the Too Hot Tamales, introduced us to their version of an avocodo and orange licuado–it was deliciously refreshing and a wonderful way to use ripe avocados. With the hot sunny weather here in LA and Cinco de Mayo coming up, we found the perfect antidote. It’s best to use freshly squeezed orange and lemon juice for the freshest taste, but if you’re running short on time or need to make a big batch, then it would be acceptable to use bottled juices. In a plate, mix equal amounts of salt, sugar, and chili powder and spread evenly. Swipe the rim of the serving glasses with lemon and rim the glass with mixture and set aside. In a blender, combine the orange juice, lemon juice, agave syrup, orange zest and salt with the ice and blend thoroughly. Then add the avocado and milk and blend until smooth. Taste and adjust the sweetness and orange zest if needed. Pour into rimmed glasses and serve immediately with desired cookies. To add an alcoholic touch to this perfectly healthy drink (everything in moderation right?) try adding a small amount of tequila to the licuado. 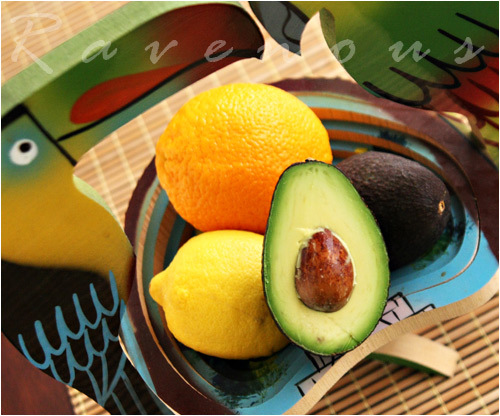 Did you know that over 80 million pounds of avocados are consumed on Cinco de Mayo? No doubt the vast majority will go towards guacamole, but save some avocados and make these deliciously refreshing licuados to liven your Cinco de Mayo! 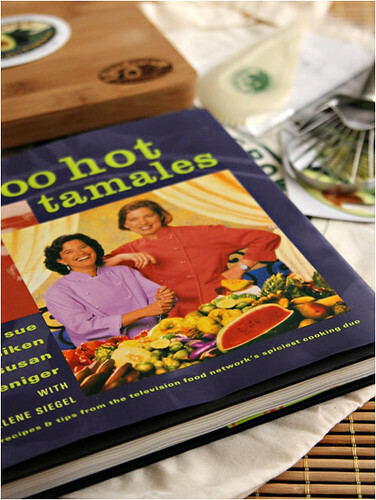 To continue with our 1 year blog anniversary and celebration of Cinco de Mayo, we’re giving away an autographed copy of Too Hot Tamales by Susan Feninger and Mary Sue Milliken as well as goodies from the California Avocado Commission including a lovely reusable tote bag, avocado cutting board, avocado scooper and stainless steel slicer. 1. If you’re not subscribed to our blog, subscribe and leave a comment saying you subscribed for one entry. If you already subscribe just leave a comment for an entry. 2. Like our Facebook page and leave a comment stating you joined for another entry. If you’re already on our Facebook page, leave a comment saying you’re already a fan as an entry. 3. Get another person to subscribe or join our Facebook page and leave a comment saying you got someone (leave a first name and last initial in the comment ) for another entry. 4. Tweet this giveaway with a link back to this post with the tag @ravenouscouple and leave a comment stating you tweeted for another entry. Please make sure we can contact you. Contest runs until Saturday May 8th midnight pacific time is now over. The winner chosen by random.org is #15, Cheryl! Your tenacity with 3 entries paid off! Beautiful pics and a fantastic giveaway you guys!! What a delicious recipe. We'll have to try it tonight. I still have a US address, can I participate in the giveaway? Great recipe and fun giveaway! Congrats on your fantastic year of blogging! Great giveaway, I love avocado's! What a delicious smoothie! And a great giveaway! hi there. i am subscribed! avocado in a drink?! Sweet!!!! That's a really innovative way to make it more interesting. Definitely worth trying. I love avocados, but have yet to drink one. I'll have to try this! Good Luck on the giveaway. I'm sure it will be a great success! With or without the liquor, it looks like a great cocktail. i am a new subscriber! thanks for hosting a wonderful giveaway and sharing all of your wonderful recipes! This is an intriguing combination of flavors. 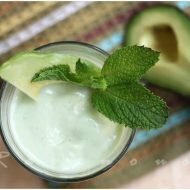 I like the idea of the sugar, salt and chili mixture on the rim, it must add a neat flair to the refreshing citrus spiked avocado smoothie. Very nice photography & presentation! I love avocado milkshake! With hints of citrus, I bet it is even more refreshing. This drink sounds about perfect, love all the flavor combinations – avocado in any form is alright with me. I love avocado sinh to – so I'm definitely going to have to try this one. Awesome giveaway – go avocado! Happy Blogiversary and wishing you both another fantastic year! Cheers to more fab recipes! 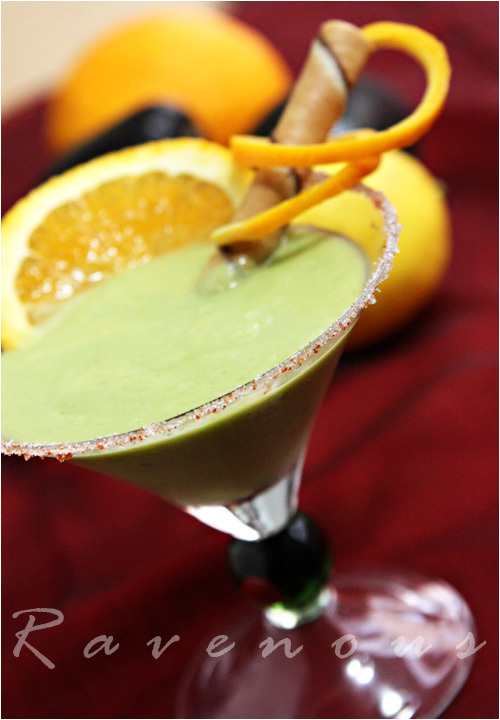 Love your picture of citrus and avocado drink, so refreshing! i am now a subscriber, please let me win! I am subscribed. I always check your blog and did not realize that you have giveaways! I too love avocados but have yet to try it as a drink. I will give it a go. I would love one of those licaudos right now! This sounds like a really delicious drink. Great blog. Congrats on your blogiversary! Congrats!! Of course I'm a facebook fan! Woothoo! I so need this drink right now! Thanks for the fun giveaway!